I didn’t even know what Cobb salad was until I saw the movie Julie and Julia a few years ago. When I finally got around to googling a recipe, I had to come up with my own twist. My thinking is that if a recipe already includes avocado, bacon, and egg, it will be just fine without chicken. Instead I decided to add Creole-seasoned lentils, which added a really nice depth of flavor and another texture. Dice bacon and fry in a heavy skillet over medium heat until crispy. Set aside to drain. Reserve 2 tablespoons bacon grease in a small bowl. Wipe the rest of the grease out of the skillet. While the lentils cook, hard-boil the eggs, then let cool submerged in ice water. Dice avocado and toss with lemon juice to keep them from getting dark. Grate carrot and chop tomato. In a very large shallow serving bowl (or on a platter with at least a 1-inch rim) combine salad greens, carrots, tomatoes, feta cheese, and avocado. Toss with Italian dressing. When eggs are cool, peel and quarter them. Arrange them across the top of the salad. 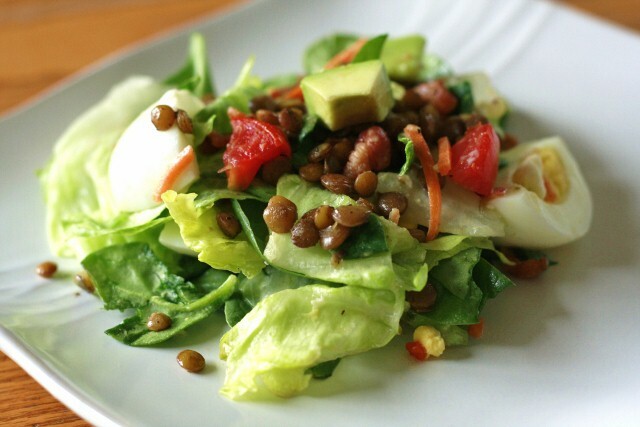 Sprinkle salad with cooked lentils and bacon. Serve, with additional salad dressing on the side, if desired. I love the look of that salad, Mary! I’m going over there and printing that off! We have made this several times now. Thanks for such a tasty recipe!